So since my first visit to Assa in 2010 I've been back a few more times with my Korean food loving friends. It's in such a convenient location for pre-theatre meals, and it always helps me deal with my kimchi cravings when they hit. This latest visit was with P before we went to go see Once (which was pretty good, but I like the film more). I have been accused of going nuts with the ordering whenever P and I get together, but it worked out well at Assa. 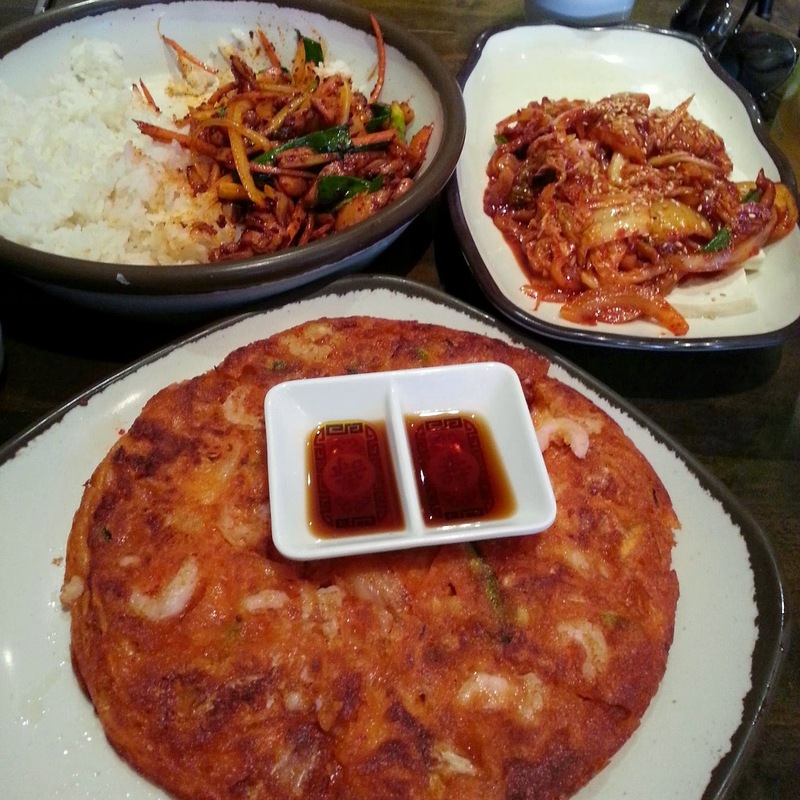 A kimchi seafood pancake was absolutely terrific - crisp crust, juicy seafood and the fermenty funk of kimchi all combine well here (plus the pancake didn't fall apart like it does at so many other places). I also loved the kimchi and pork belly over tofu - it felt like a relatively light dish due to all the tofu and cabbage, but the shreds of pork belly gave it this incredibly luxurious edge as well. And finally, a spicy chicken dish - probably the most "normal" dish of the evening but it came with plenty of rice for two people and was a great way to round off the meal. All that, plus a couple of Korean beers - exactly the right amount for greedy people like me and P.